Chinese President Xi Jinping made a state visit, full of pomp and circumstance, to Pakistan on Monday, but its centerpiece was a $46 billion investment in the country, dwarfing the US Congress’s $7.5 bn. program initiated in 2008. Whereas the US likes to sell useless weapons systems that either rust in warehouses or foment wars like that in Yemen, China’s investment is divided between $11 bn. in infrastructure and $35 bn. in energy. 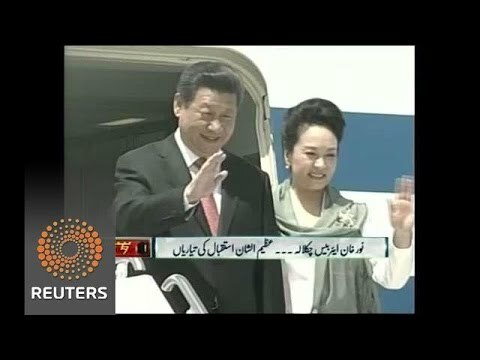 President Xi underscored that Pakistan had been his country’s friend back in the 1960s when China was isolated on the world stage, and called Pakistan China’s “Iron Brother.” (In the 1960s India and China had had a brief border dispute, and Pakistan and India have had a long term set of struggles over Kashmir, so Pakistan and China allied, in part against India). New rail lines will be built to Karachi and to the new port of Gwadar on the Arabian Sea near Iran. Some will go through Baluchistan, tying that restive province, which has seen a separatist movement, more tightly to Islamabad. For its part, China will be at the mouth of the Persian Gulf, and appears to hope for pipelines bringing oil across Pakistan and the Himalayas up to Xinjiang. (In my own view, by the time all those pipelines and deals are done, China will have largely transitioned to electric cars fueled by renewables). Since last June, Pakistan’s army has somewhat inexplicably turned on its former allies among the Pakistani Taliban with a big aerial bombing campaign (“Zarb-e Azb”) aimed at disrupting the Haqqani and other terrorist networks that had been targeting US troops and the Afghanistan National Army across the border. Haqqani leaders are said to have scattered. China appears to have made a defeat of the Pakistani Taliban insurgency a prerequisite for the CPEC, perhaps because of their links to Uygur fundamentalists. And, obviously, Pakistan can’t be Hong Kong West if it is routinely blown up by Taliban. Because the Chinese plan involves a great deal of transit trade for Pakistan, and because China is wisely attending to energy and infrastructure, the CPEC could have a tremendous impact on the Pakistani economy, which has been lethargic in comparison to India’s in recent years. “Between FY2002 and FY2009, only 30 percent of US foreign assistance to Pakistan was appropriated for economic-related needs; the remaining 70 percent was allocated to security-related assistance. In the period since the KLB authorization (FY2010 through the FY2014 budget request), 41 percent of assistance has been allocated for economic-related assistance.” But 100% of the CPEC is development aid and loans, which in turn are aimed at increasing trade and manufacturing. If the $31 bn. the US has spent there since 9/11 had been structured more like the Chinese plan, the US might have won in Pakistan. As it is, it is relinquishing that sphere of influence to China.